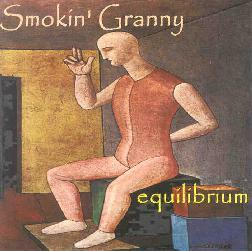 Smokin' Granny - "Equilibrium" / Groove Stream Attractor - "Into The Vortex"
Smokin' Granny's last album, Tarth Shooke, was in this fans opinion their strongest release to date and a tough act to follow (see AI #19). So when I first played their newest CD, Equilibrium, I was wondering what to expect. The band has maintained a fairly stable lineup over the years and still consists of Todd Barbee on saxophones and WX7 midi wind controller, Jeffrey Damon Lindsey on drums, Brian Preston on bass, David Oskardnay on acoustic guitar and Steve Hatch on guitar (though this album includes Hatch's last recordings with the band). The album opens with "Sparky Goes To Wonderland", which includes crushing bass, funky wah guitar and freaky sound colorings that result in a cross between jazz fusion and the kind of avant rock and jazz that I recall hearing years ago from Material and Massacre. The piece meanders along for a bit, alternating between freeform exploration and a more goal oriented feel, with full band explosions popping in along the way. "Mr Piperson's Revenge" is next and is Smokin' Granny's interpretation of Soft Machine's "Pigling Bland" (from Fifth). It's a rollicking jazz/prog rock tune with Todd Barbee's magical Midi leading the way through multiple movements in a mere four minutes. Excellent! Continuing the Soft Machine motif, "Bone Dust" is partially based on the song "Bone", also from SM's Fifth album, and is a raucous glom of space jazz and whimsical, bouncy sounds. But things really take off with "Iron Tongue Of Midnight", a psychedelic prog-jazz tune with freakiness galore. The guitar (but ya never know when it might be the Midi) is mind boggling with its wailing Fripp-in-space licks. The sax and Midi do the same, but there's also a pounding Stoner groove at times that injects a metallic edge into the music. Lots happening here... tough to describe... exquisite. This may well be my favorite Smokin' Granny tune to date. "Opposable Thumbs" has a similar prog-jazz flavor with bits of heavy rock. "Pressure Point" raises the intensity level with more heart thumping and often stoned bass lines, shimmering ambient guitar effects, and seductive melodies from the sax, all coming together to create a gorgeous tripped out jazz groove. "Dextrous Creature" is similar, with the band rocking hard and going waaaaaaaay out into the stratosphere. Another standout track! The ultimate marriage of jazz, prog and space. In summary, Equilibrium is a more than worthy successor to Tarth Shooke, being a heavier and more intense album, and expanding upon the complex constructions that make all of Smokin' Granny's music so exciting. A beautiful blend of jazz, grooves, ambience, progressive rock and avant-garde elements. These guys have brought together numerous recognizable sounds and styles and developed a voice all their own. Not a small feat. Groove Stream Attractor is another project from the Smokin' Granny clan, featuring the quartet of Todd Barbee, Jeff Lindsey and Brian Preston from Smokin' Granny, with Ted Johnson on synthesizers (who also played on a couple tracks on Equilibrium). I reviewed their first album in AI #20, though the promo sheet indicates there's been two more releases prior to this new CD, Into The Vortex. If "Smokin" is an appropriate part of the Smokin' Granny band name, "Groove" most certainly fits in with Groove Stream Attractor. The CD is loaded with dreamy groove laden ambience. The rhythm section of Preston and Lindsey maintain a steady but assertive pace throughout, as Barbee and Johnson paint their melodic, alien space fusion scenes. The title track is representative, featuring head boppin' downbeat grooves with spacey alien keyboards. I love the mixture of sax and pulsating cosmic keys. Across its 9+ minute length the band crank out a gorgeous blend of jazz hooks and lulling Tangerine Dream styled soundscape creation. Total space-fusion with a capital K... for Kosmic. "Last Ship To Mars" is a standout track with a bit of a Reggae vibe that recalls the British festie psych bands. But Groove Stream Attractor, in part due to Barbee's Midi, are traveling in different regions of the universe... though the effect on your brain will ultimately be the same. "Mayan Odyssey" and "The Edge Of The World" are both lengthy stretch-out tracks that dive even deeper into melodic ambient soundscape realms. The former adds tribal beats and ethnic influences to the mix. Veeeeeeery relaxing. Freeeee your mind. The early part of the nearly 13 minute "Cicadian Symphony" bears similarities to Smokin' Granny with its full band jazz feel, though the trademark Groove Stream Attractor space vibe dominates. But the latter part of the track has more prog rock styled keyboards. Lots of variety but it all flows smoothly. One of my favorites on the album. "The Ancient Mariner" is another strong track with emphasis on the progressive rock influences, though it's as spacey and floating as anything else on the album. 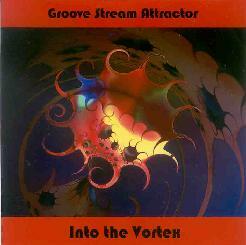 If you like ambient music but could do with a bit of toe tapping and meditative head throbbing, along with a healthy dose of jazz, then check out Groove Stream Attractor. For more information you can visit the Metaphoric Music Productions web site at: http://www.metaphoricmusic.com.